So many times, here on The WED Page, I have spoken about attractions, shows and resorts that never came into being. Last week I came across a photograph of a model, which was included in brochures in, and around, 1977. The photo depicts the Walt Disney World’s monorail system extension, to what was then known as Lake Buena Vista Village. 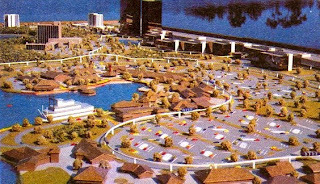 While Imagineers originally planned to have a monorail loop running from the Transportation and Ticket Center to the shopping village around Lake Buena Vista, the idea never became a reality. The only information I could find on why this never came into being states that it was cost prohibitive to do so. I am a huge fan of the monorail. As children, it was as big of an attraction to my brothers and I as anything offered in the parks. I can only imagine how wonderful it would have been to take the long ride to Downtown Disney today. This brings up the interesting question of whether Disney is looking at some transportation alternatives for a currently limited monorail system and a bus service that they would like you to rely upon, but has some rather glaring drawbacks for anyone who visits the park frequently. I, too, love the monorail and wonder if anyone has reconsidered this in light of a changed economic and environmental landscape and a general desire to get cars *and* busses off the road. I think we could certainly expect a Monorail extension based upon the Green Movement these days. Although I fear Bio-Buses are a more likely option. Only time will tell, but new forms of mass transit in Disney areon the horizon, in my opinion. Obviously, my vote would be for more MONORAIL. I would have loved to have seen more use of the monorail transportation. Using it to link up Downtown Disney, for example, would have been great! I can only hope that new monorail tracks are somewhere in the future for Walt Disney World... Great article, Tony! Would love to see things like this finally come to fruition. I recently blogged about how certain hotel experiences don't capture the Disney magic for me because of the overreliance on bus transportation (versus the old days where everything was on the monorail loop). It just seems to me that a lot of destinations within the World could be reached by a monorail extension in a perfectly smart and feasible manner. Especially given environmental concerns. Just putting in my 2 cents worth here. And it's no surprise that I, too, would love to see a monorail extension. It's definately my favorite mode of transportation at Disney. From the TTC to Downtown Disney would be a great place to start. Maybe putting a station somewhere in between that is easily accesible from some of the resorts around the Epcot/ Hollywood Studios area. Anyway, just a thought. There is of course a practicality issue. Buses can run more frequently and you can have more of them in service on the roadways than monorails on a single track without fear of breakdowns causing traffic problems. That said, I still vote for the monorail system and wish it would extend to other urban areas as well. Heck, imagine travel across the country in one of these sleek machines! And what would you rather look at, a bunch of buses or the amazingly beautiful lines of the monorail?